Dakota was on The Tonight Show with Jimmy Fallon last night to promote The Alienist! They talked about Dakota’s overpacking, her favorite body soap, filming/eating in Budapest and more. You can watch a video of her appearance below. Dakota visited AOL Build yesterday, along with co-stars Luke Evans and Daniel Bruhl, to talk about The Alienist. They talked about their characters, the differences between the book written by Caleb Carr and the show created by Cary Fukunaga, Dakota’s costumes and more. Our gallery has been updated with photos of the trio during their interview, as well as photos of Dakota outside the event. You can watch the complete video below. Dakota gave a phone interview to Collider.com recently, and she talked about getting involved with Neill Blomkamp’s short film Zygote, wanting to work with him, why this character was appealing to her, the physical challenges of this shoot, why she feels like she’s in a good place, creatively, and more. You can read the complete interview below. From filmmaker Neill Blomkamp and made through the experimental Oats Studios (which is looking to make original short film content that will eventually lead to full-scale feature films and series from the titles they create), the sci-fi short Zygote follows two lone survivors (Dakota Fanning and Jose Pablo Cantillo) who are forced to fight for their lives. Stranded in an Arctic mine, they must evade a horrific and terrifying creature that can anticipate any move they might make. 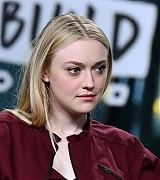 During this 1-on-1 phone interview with Collider, actress Dakota Fanning talked about how she got involved with this short, wanting to work with Neill Blomkamp, why this character was appealing to her, getting to see the creature come alive, the physical challenges of this shoot, being open to further exploring this character, if they were to make a full-length feature, and why she feels like she’s in a good place, creatively. Collider: I have to say, I really enjoyed this short, but the creature has stuck with me since I watched it. What did you think of the creature, once you saw the final visuals? 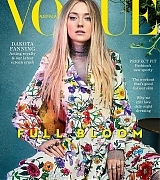 DAKOTA FANNING: I saw images of what it was going to look like, but of course, it was completely computer generated, so when I saw it for the first time, it was so much grosser than I had pictured. It was cool to see it come alive. The noise, the movement and realizing what it’s made of was so gross. When and how were you approached about this project, and what were you told about what this would be? FANNING: I worked with Neill Blomkamp on his BMW commercial (The Escape) last summer. We shot for 10 days and got to know each other a bit, and then a few months later, he asked if I would be interested in doing an experimental project – a short film – for his studio and he sent me the script he had for it, at the time. I loved working with him so much and I think he’s so talented, and I thought that this idea was super cool. I was excited to be a part of something I’ve never really done before. This was the kind of character I’d never played. And then, when I got there and saw what everything was going to look like, in the end, I saw how talented the people were who were working on it. With the special effects, I learned a lot and was excited by it. Just from working with him before, he thought of me for this and the timing worked out, so here it is.